I’m pretty sad about Stu retiring. He became one of my favorite players as soon as he came over from Buffalo. I can’t remember how many times we traded for a player who did really well AGAINST us and then failed miserably for us (Turgeon, Young, etc). Stu was definitely not one of those players. He more than made up for scoring the tying goal in Game 6 of the Stanley Cup Finals that forced the Stars to win it in 4 overtimes. Last season, I said several times that Stu looked slow and he needed to call it quits after the season. Then he managed to find another gear in the playoffs. I wonder how we would have done if he hadn’t gotten the concussion. After his performance in the playoffs, I wished that he would sign for another season. I didn’t get to see him in a playoff game this year and I really hoped that the game I saw in March wouldn’t be the last time I’d see him. Stu was one of the guys who came out at all 3 practices that I’ve been to. He was nice and ALWAYS smiled for the camera. 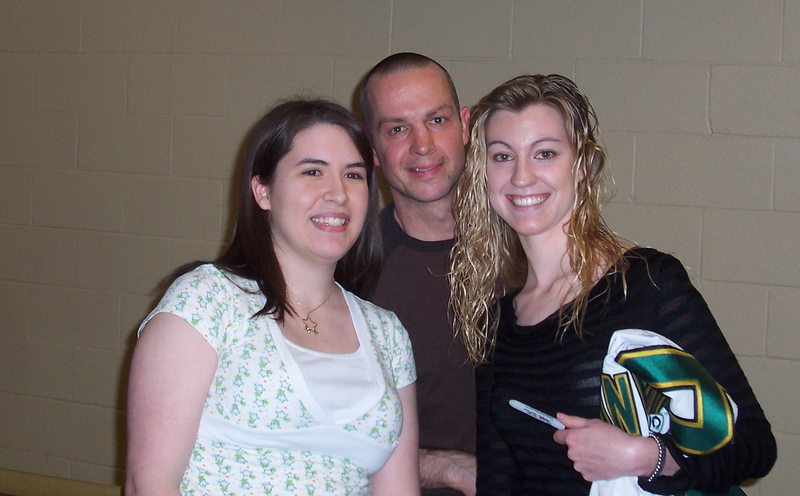 This is the first time Sarah and I met Stu (in 2003). His black eye is still the coolest one I’ve ever seen! March 2008, after the last game we got to see Stu play in. I am so glad he’ll be staying with the Stars. I’m just going to miss seeing him out on the ice. Hockey season is finally getting closer, so we’re starting to get some interesting hockey news (not those ridiculous “summer” updates no one cares to read). First and foremost, Stu Barnes announced his retirement today. I’m sad that Stu won’t be on the ice for us this year, but I am glad he decided to stay with the team. He has a had a great career and the Stars site put together a really nice video of his career. Because of him, I was able to have one of my greatest Stars fan moments ever. 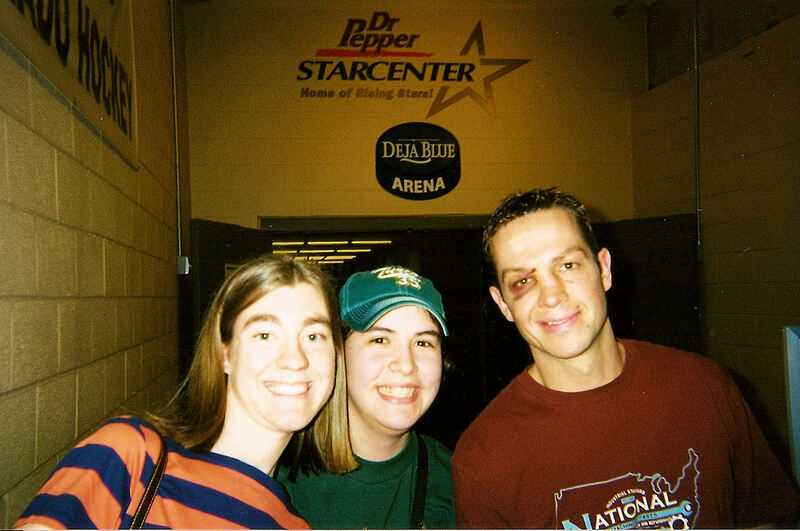 I was in Buffalo for a Sabres/Flyers game a couple days after Stu was traded to the Stars. I walked in one of their fan stores, walked directly up to the lady behind the counter, and asked her if the Stu Barnes jerseys were on sale. Now Buffalo being Buffalo, she didn’t even respond… but I know I got my message across! The Stars IceBreaker is on September 13th this year. I haven’t been able to attend one of these before, but they look like a ton of fun. Brenden Morrow is still amazing. I watched the shortened version of Game 6 against San Jose last night, and Brenden never fails to amaze me. Marty and his wife had their third child (and first boy) yesterday. I haven’t heard of a name yet, but I’m sure Marty is excited to finally have a little boy. Brenden and Marty made a surprise appearance at the Rangers/Yankees game a few nights ago. Sarah and I were just at the Rangers/Blue Jays game last Friday, but sadly we missed any wonderful hockey player appearances. That definitely would have made the game a lot better. Sarah and I have always had the fantasy of opening our own hockey-themed restaurant in the West End where Stars fans could gather and have fun before games. We would name the restaurant “Zamboni’s” and serve all sorts of interesting kinds of food. There were also plans for a yard in the back with moose (yeah I love moose) who would be named Zamboni and be the restaurant’s mascot. However, we ran into several problems with this. First of all, Sarah discovered that Mr. Zamboni was quite the idiot. Apparently it’s illegal to call anything but the zamboni by that name. And also, it’s not just a “zamboni”, it’s a “Zamboni Ice Resurfacing Machine” (it’s actually always supposed to be called that). Then the property we wanted in the West End was leased to another restaurant. Luckily, they’ve already gone out of business so our preferred area is back open! I also think it’s probably illegal to have a moose at a restaurant, but I haven’t checked that out yet. Instead of owning a restaurant, we could own our very own Zamboni (Ice Resurfacing Machine). 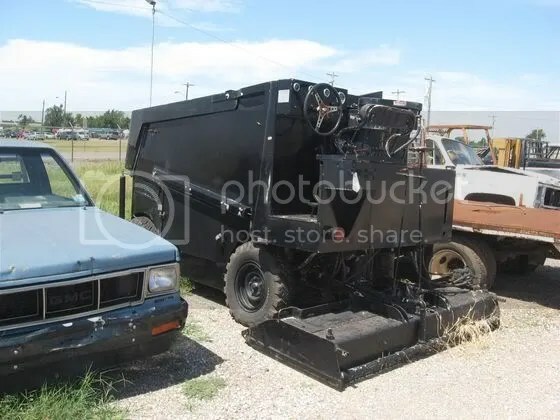 Turns out the State Fair of Oklahoma is going to be auctioning off a Zamboni. Now I know she’s a bit of a fixer-upper, but how amazing would it be to ride to Stars games in this? I’m not sure how it does on mileage and we’d have to start 4 or 5 hours before the game, but this definitely seems cooler than just having some silly restaurant. Sorry about the complete lack of posts for the last month or two. I thought I’d have more time to blog since I’m not in school for the summer, but I ended up not really having anything to blog about… or at least anything that most people would want to read. Now that it’s August, school is starting soon and hockey is sort of starting up again (hey, training camp is only a little over a month away!) so I’m going to get this place up and running again. Sarah and I took a roadtrip to Frisco to see a day of the Stars development camp at the beginning of July, and we both had a blast shopping at Stonebriar and seeing the new Baby Stars. I was a bit disappointed that Lindgren wasn’t there, and then more disappointed when I realized he wasn’t there because he went back to Finland to get married! It was also great to see Myra and her daughter while we were there. Talk about a nice surprise! I really hate the Sean Avery signing. I almost wrote a blog about it and then decided that I was way to angry to write anything coherent. I still don’t like it and I’m holding out hope that Brenden will kill him during training camp so I don’t have to see him this year.